Mr. G’s Chicago Style Pizza & Italian Food is a great place to enjoy great dining in Branson as it offers delicious pizza for the whole family in a friendly environment. Mr. G’s pizza has been serving Chicago style pizza and other favorite items in downtown Branson for over 20 years. This is the perfect dining spot in Branson to enjoy lunch and dinner along with your favorite pizza and pasta. Beautifully located around the corner from old downtown Branson, Mr. G’s is proud in providing guests delicious Chicago style pizza along with some excellent sandwich and salad options too. Guests dining at Mr. G’s can enjoy one of Branson’s best kept secrets, classic four cheese and beef raviolis dipped in Italian bread crumbs and fried to perfection. 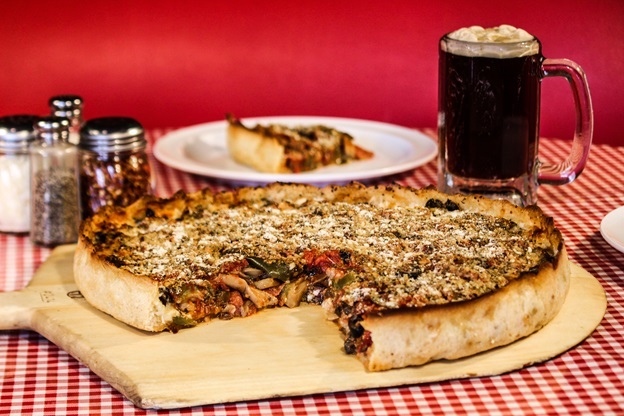 Mr. G’s Chicago Style Pizza in Branson offers authentic, Chicago-style pies in a local hangout, pub-like atmosphere that’s perfect to have a pizza and a beer. If you enjoy a few drinks, some delicious pizza, wings, or excellent Italian dishes like lasagna, served in huge portions, then visit this great dining place and enjoy your evening. Like to enjoy dinner with the whole family at home? Mr. G’s Chicago Style Pizza is happy to make your favorite pizza ready for pick up. Mr. G’s is a go-to pizza place for locals and a great dining spot for Branson visitors to stop by, so find out for yourself why they keep coming back to this place. At Mr. G’s, you’re sure to enjoy the very best deep-dish pizza. First time visitors to this place could not believe how great is the pizza. It’s so fresh, really tasty with some special herbs and loaded with ingredients, not just crust and tomato sauce. As a local restaurant, Mr. G’s is very particular about fresh high-quality ingredients, great service and providing a fun atmosphere. The flavor of Mr. G’s pizza is impeccable, the crust tender but crispy. The atmosphere that you can feel around is that of a casual pub, clean, and smoke free. If you want to get the full experience at Mr. G’s, you should go with the Chicago style pizza. The Chicago style pizza at Mr. G’s is better than most outside of Chicago. It’s worth a try in this great dining place if you have never had Chicago style deep dish pizza. Try the cheese on the bottom, sauce on the top, thick and crispy crust. Mr. G’s Pizza is one of the best pizza in town and so far the best meal that you can enjoy in Branson. Mr. G’s has been around in Branson for years. Though the establishment is small, the current owner, a Branson local takes great pride in quality food and hospitality. Mr. G’s Chicago Style Pizza was voted best pizza in Branson and guests frequenting the place know why. So, if you want to experience a unique dining in Branson, don’t miss to visit Mr. G’s Chicago Style Pizza and enjoy the delicious taste of Chicago style pizza, sandwiches, and salads.